The State Indoor was held Friday on the campus of NDSU. The top boys performances came from seniors Jake Arason (Two Mile) and Marcelles Sartwell (800m), who battled each other in a thrilling 800m last weekend at the Cobber Indoor. Both athletes placed third in their respective events. More to come from these races in the Dorsey Run-Down below. The other top placer at the meet was senior thrower Brett Klefstad. He followed up his huge PR last weekend with another strong performance, placing 5th with a toss of 46’4.5 in the shot put. The throw is the second-best of his career. Turning in additional strong efforts at the State Indoor were seniors Austin Oehlke, Cade Johnson, and Nate Pressnell, who continued to drop his 400m time (58.11), passing most of his heat with a devastating second lap. Pressnell also filled in for a banged up Stoker Short as lead-off in the 4×400 with a 58.3 split. Oehlke notched a big PR in the 60m (7.63), dropped below 25 in the 200m (24.85), and ran a great 4×2 leg (24.5). Johnson managed another PR in the shot put (41’2) after making huge gains at the Cobber Indoor. Look for these seniors and many other athletes to have break-out seasons in 2019. The future is bright for track and field in Grand Forks. With a group comprised mainly of underclassmen or first-time track athletes, the RR JV boys scored points in bunches Saturday morning to finish 2nd behind the GFC JV Boys squad. Leading the charge for the boys was freshman Dilson Gurung, who won the long jump (18’10.5) and placed second in the 60m Hurdles (9.39). Not far behind was classmate Amit Rasaily, who placed first in the 60m Hurdles (9.21). Rasaily ran two scintillating relay legs in the 4×200 (23.9) and 4×400 (56.0), with the 200 split now the fastest of any Rider in 2019. Monoj Rai and Ted Tchomakhidze completed the final two relay legs for the team, who won their race in dominating fashion (1:42.37). In the 4×400, freshman Dameon Zenawick ran a strong lead-off leg before Rasaily, Rai, and Gurung closed out their strong meet. Sophomore Tyler Larson was the team’s only other champion, winning the shot put in a PR toss of 39’3. Other athletes with notable marks included newcomer Michael Nottestad (5th-60m-7.78), Tanner Bernhardson (5th-60m Hurdles-9.77), Zenawick (6th-400m-59.03), Matt Rongitsch (5th-800m-2:20.93), Abram Hall (4th-HJ-5’2), Erik Walker (4th-PV-8’9), and Evan Hutchison (5th-SP-37’8). 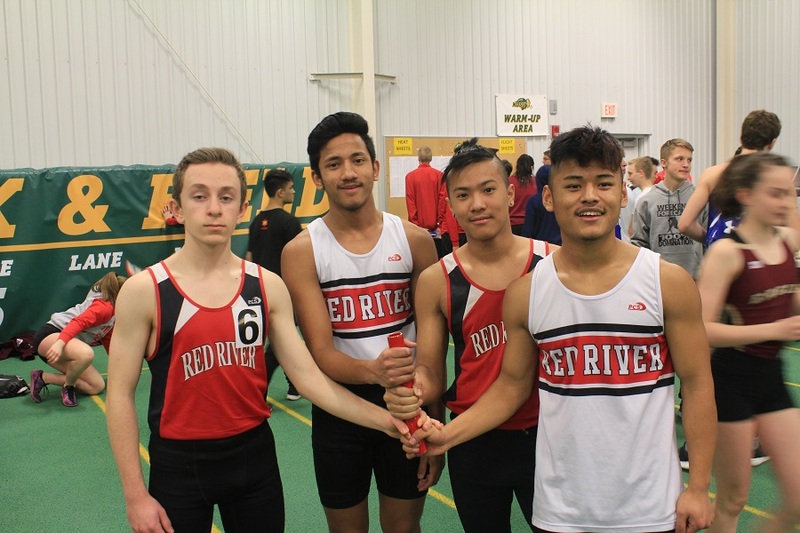 The Red River distance and mid-distance groups followed up their strong performance at Concordia with another good showing at the State Indoor meet. After a thrilling finish in last week’s 800m against teammate Jake Arason, senior Marcelles Sartwell threw down a 2:06.36 to place third. This mark builds on his season PR and lies only 1.61 seconds away from his outdoor best last season. A week after winning the 1600m, the aforementioned Arason switched gears to compete in the 2-mile at the State Indoor meet. Arason ran 10:08 and placed third, improving on his indoor PR from last season by 28 seconds. His time is only 3 seconds off of the state qualifying time, which he earned last season at the Howard Wood Dakota Relays. He hopes to break his PR of 9:59, which he ran at the Hoka One-One Postal Nationals in November, once the season moves outdoor in April. The final placer for the “D-Krew” was sophomore Ryan Prusak, who also placed at the Cobber Indoor last week. His 4:59 was fast enough to place 8th in the mile and set a new indoor personal best. The JV State Indoor also included many place-worthy performances. 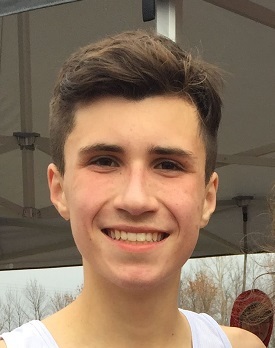 8th grader Matt Rongitsch placed 5th in the 800m run with a time of 2:20.93. Matt was a top runner for RR’s cross country team this fall and his 5k time ranked him the #7 8th grader in the nation by milesplit.com. Freshman Dameon Zenawick, another member of the cross team, placed 6th in the open 400 (59.03) and ran the fastest leg (2:21.0) of the 3rd place 4×800 team. The other members on the team were sophomore Om Panda (2:34.3), sophomore Erik Stokke (2:32.0), and junior Michael Bartholomew (2:28.8). The distance team will transition from their typical 1600m and 3200m runs to the collegiate 1500m and 3000m races at EDC this Friday. -Dorsey is a junior distance runner for the Riders and an aspiring sports journalist. 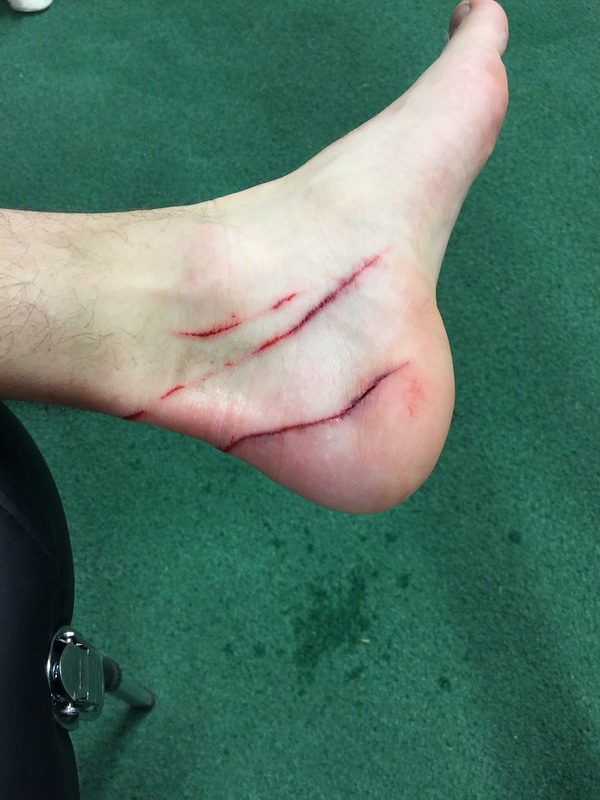 He is currently healing his wounds after a painful Mile race at the State Indoor. Stoker: Hey look, the best soccer player in the state does track…hey look, so does the second-best soccer player in the state. Coach Bakke: Interesting how that works. I guess it is possible to do both sports. Who knew?